Think about it - if we're throwing a baby shower and we want everyone to feel giggly and happy, we should use loads of gerbera daisies because they're so open, bright, and whimsical. If we use lush, frilly, sophisticated ranunculus instead, the mood is suddenly more sweet and refined. See what I mean?! That's why these moody, romantic arrangements put together by the ever-fabulous Whitney are the perfect choice a couples' dinner party. 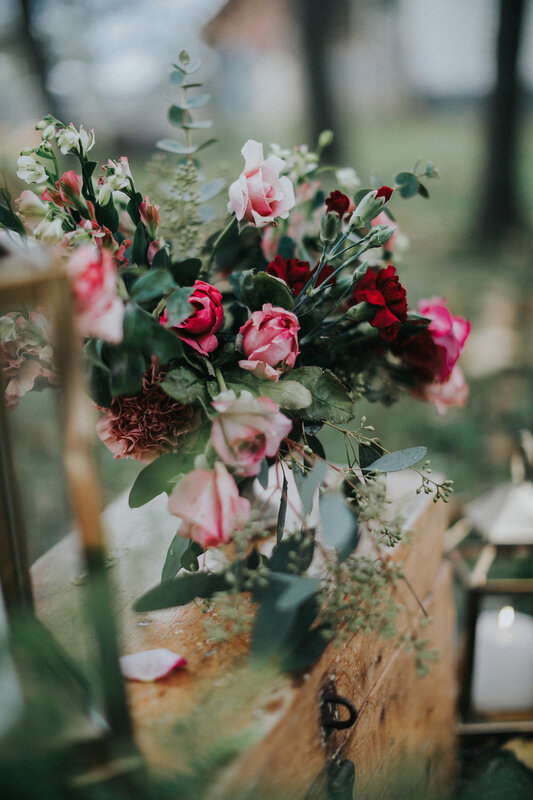 She used roses, carnations, and eucalyptus, along with some greenery and filler from her yard to make the arrangements look full and dramatic. I think the mix of light and dark roses gives the entire tablesetting such a moody - as opposed to just sweet - romantic feeling. Just imagine how different this table would look if Whitney had used tulips or orchids instead! Of course, in my book, the only truly wrong flower choice is choosing not using them, so no 'shade' intended, tulips and orchids! It's actually very cool to realize how much control we have over creating the mood for our guests simply based on the flowers we use, don't you think?! So what kind of 'flower mood' will you set the next time you entertain?